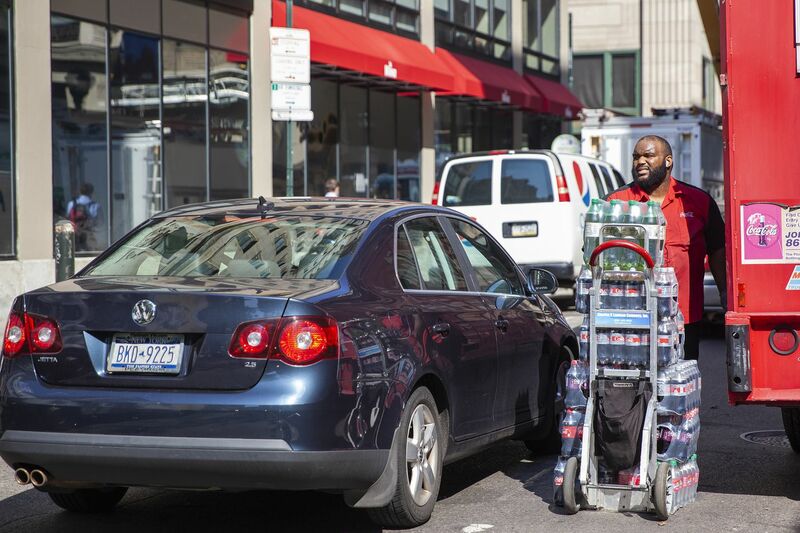 John Walker waits for traffic to pass while he makes a delivery for Coca-Cola on 13th between Sansom and Chestnut in Center City. The kitchen doors at Sampan typically open by 6 a.m.
Carts of raw ingredients, up to $10,000 of food on some days, are rolled in to make possible the 40 dishes on the Center City restaurant's menu each night. Crates of fish, meat, and poultry are hauled from box trucks into Sampan until as late as noon some days. The restaurant is near the corner of 13th and Sansom Streets, where eateries offering pan-Asian, Mexican, sushi, pizza, or just a cup of coffee all thrive within steps of one another. Each has a similar morning ritual. That means trucks — a lot of them — fill the streets. "It's the nature of having a restaurant in a thriving restaurant scene in Philadelphia," said Natalie DiBattista, director of operations for Schulson Collective, which owns Sampan. On Monday, more than a half-dozen trucks making food deliveries parked all at once near 13th and Sansom. Take that scenario, and multiply it by the more than 450 restaurants in greater Center City, according to the Center City District. Then add in deliveries to the district's nearly 1,000 retailers, the occupants of 41.2 million square feet of office space, and 190,000 residents. By blocking bike lanes and sidewalks, double-parking in travel lanes, or stopping at the corner of an intersection, the trucks can bring traffic to a standstill and endanger people by reducing visibility or forcing cyclists into traffic. "We're at a point where we obviously have a more and more scarce resource … the public street," said Paul Levy, chief executive of the Center City District. An estimated 18,000 deliveries happen each day just in Center City's four core zip codes. Last April, the Delaware Valley Regional Planning Commission issued recommendations on truck traffic in Center City, but few changes have been made. Officials from the city and the Philadelphia Parking Authority, though, say a new approach is on the horizon. Walt Mulholland unloads his truck as he prepares to make deliveries to multiple restaurants, including Sampan and El Vez on 13th between Walnut and Sansom Streets in Center City. The city's Streets Department this year expects to finish the first comprehensive map of parking in the two most dense areas — Center City and University City. Meanwhile, the city is exploring funding recommended in the DVRPC report and has a $100,000 grant to study truck parking issues in Center City. There is a recognition that how loading zones work now, with many ending truck access after 10 a.m., might not fit the city's needs. A report on the city's transportation plan released Wednesday described the need for a truck network that would channel truck traffic to streets able to accommodate it and away from others. "Not all of those uses can happen on every street," said Chris Puchalsky, the city's director of policy and special initiatives for the Office of Transportation, Infrastructure, and Sustainability. Meanwhile, the PPA is seeking to make illegal parking more costly to delivery companies. The agency wrote to the mayor's office last month to recommend fee and fine increases, something that requires City Council approval. Among the recommendations, it proposed doubling the fine for double-parking to $100, and raising the cost of a permit allowing a contractor's vehicle to occupy a parking spot from $150 to $600 in Center City and University City. Local and national experts, though, say coping with truck traffic by penalizing truck companies is akin to shooting the messenger, or, more aptly, the delivery person. "The reality is it's us as consumers and the businesses that are really driving the whole thing," said Mike Ruane, the DVRPC's senior transportation planner. Part of the challenge in managing deliveries is the many forms they take. A truck delivering to a restaurant has different needs from one delivering to an office or apartment building. An ongoing obstacle, officials and experts say, is a lack of information on exactly what spaces are available for deliveries, how truck drivers are using that space, and what the needs are of the mosaic of businesses, offices, and homes in Center City. Philadelphia, like most cities, doesn't have a lot of that information, said Erick Guerra, assistant professor of city and regional planning at the University of Pennsylvania. "One of the big first steps is closely analyzing and understanding the problem," he said. "I'm not sure that's quite been done yet." Experts said that in the long term, the solutions lie with close planning and coordination with the businesses and people receiving deliveries. "I see no way out without trying to push for behavior changes," said José Holguín-Veras, a Rensselaer Polytechnic Institute engineering professor focusing on freight. It takes no effort to find illegally parked trucks. One recent day, a FedEx truck with a parking ticket on its windshield stopped in a bus zone. A cleaning company's pickup with an attached trailer, a food delivery truck, and a box truck all blocked a westbound lane near Jewelers' Row. A UPS truck made deliveries to the St. James apartments while stopped in the travel lane on Eighth Street. Aiudy Sanchez unloads Giordano’s Garden Groceries truck on 13th between Walnut and Sansom. Delivery companies acknowledge that obeying traffic laws simply isn't a priority compared with safety or fast service, executives from UPS said. "There's a lot of instances where double-parking is either the only option or potentially, even I dare say, the safest option factoring in all the different things," said Tom Madrecki, director of urban innovation and mobility for the company. "Sometimes it's really a no-win situation." UPS accumulated about $1 million in parking fines from April to September this year, the PPA reported. Near Sampan on Monday morning, a refrigerated Julius Silvert food delivery truck, one of a half-dozen trucks parked within sight of 13th and Sansom, stopped in 13th Street's bike lane. The truck had a ticket on its windshield already, but the driver, Walt Mulholland, had deliveries to complete and no plans to move. He was taking food to six nearby restaurants and expected to be stopped for about two hours. "There's nowhere to park," he said, a cluster of boxes awaiting delivery strewn around him. "No matter where I park, there'll be a bike lane somewhere." His company was billed $130,000 in parking fines in the last six months. In its September letter, the PPA proposed a raft of $25 fine increases for numerous parking violations. Scott Petri, the PPA director, has noted that PPA personnel have complained that even when loading zones are available, trucks don't always use them. "UPS and FedEx, we had them identify the spots they wanted," he said, "and we're finding they don't use them." Petri has also proposed creating parking templates, a few parking patterns that could be applied to streets depending on the mix of businesses and residences. Loading zones are now assigned by request, a piecemeal, uncoordinated approach. Experts say increasing fines alone won't change delivery drivers' behavior. Delivery companies already factor in parking violations as part of the cost of doing business, and are able to register with the PPA and be charged a monthly "invoice" for parking tickets. Fines must be accompanied by reordering stopping regulations on city streets and changing how people order and receive packages. UPS, which describes 20 percent annual growth in its delivery business, said 20 years ago, the company was typically delivering large numbers of packages to a few locations. Now, UPS said, deliveries are far less consolidated, and trucks have far more stops per trip. Online shopping's convenience and overnight delivery options are playing a role, as people turn to the internet to buy items available at corner stores, and insist on getting them quickly. A parking ticket sits on Walt Mulholland’s delivery truck, parked on 13th between Walnut and Sansom. "What percent of all the purchases using Amazon or any other internet company, what percent is truly urgent?" Holguín-Veras asked. Consolidation is needed. That could mean identifying buildings with large off-street loading spaces that could be staging areas for trucks. Goods could be brought there, and then picked up or delivered to the final destination in smaller vehicles. The city also should encourage more buildings to install delivery lockers, experts said. A package recipient would receive a message from a company that an item was delivered, and it would include a code to a nearby locker where the item could be retrieved. The Bicycle Coalition of Greater Philadelphia, a safe streets advocacy group, is exploring independently taking legal action against companies with delivery trucks that block bike lanes, a spokesperson said. Options the city is seriously considering include changing parking costs or regulations to discourage vehicles from occupying a parking spot for many hours in Center City to free up more space, and encouraging nighttime deliveries for some businesses. The Streets Department has full control over parking restrictions in Center City and would not need City Council approval to take that action, but there are concerns that shifting deliveries overnight could increase costs for businesses that would have to assign overnight staff. "It would be a hit to the profitability of the restaurant," said DiBattista, from Sampan. Businesses have some control over when they receive deliveries, either by directly communicating with delivery companies or by making choices about how urgent a delivery is, and Holguín-Veras recommended that the city consider a tax credit for businesses that agree to night deliveries. He also noted delivering at night can be less expensive for the delivery companies. Deliveries in cities are double what they were 10 years ago, Holguín-Veras said. To manage, what's needed is a comprehensive strategy of understanding the needs of delivery recipients and documenting what alternatives to door-to-door delivery exist and creating incentives to use them. "Let me tell you," he said, "we cannot sustain this."